If you came here looking for the Perseid meteor shower 2008, click here. 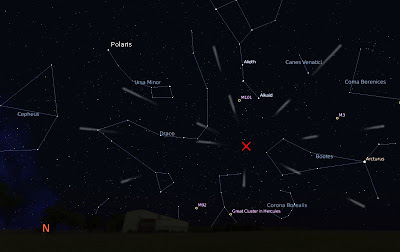 On the night of January 3rd, 2008, the annual Quadrantid meteor shower will reach its peak. The Quadrantids are named after the now defunct constellation Quadrans Muralis. While one of the most active showers for the year, the Quadrantids are rarely observed because of cold, cloudy weather. The peak only lasts a few hours, which also lessens their fame. Expect between 50 and 120 meteors per hour. Dress warmly, as it will seem much colder once you've been sitting for a while. Image created using Stellarium and GIMP. This sky chart shows the Quadrantid meteors at peak activity around 2 AM EST in northeast Ohio. The red X marks the shower's radiant, or apparent point of origin. The number of meteors shown is not an indication of the number of meteors visible at any given time. We'll probably be clouded over here in Ohio, but here's to hoping. Looks like the weather might clear up for this! That sure would be nice! Was just outside 8pm in Freehold, New Jersey…Freezing cold, but clear as could be…It was unreal meteor fell right in front of me…I did not even know about this Quadrantids shower till I looked it up…really cool!! I am def a believer now!! "Xem clip này, tôi đã khóc. Tôi khóc vì cô đấy là 1 ngôi sao lớn nhưng lại cực kỳ nhỏ bé, giản dị đứng trước mọi người. Tôi khóc vì Mỹ Tâm ko khoe khoang tôi là một ca sĩ, ngôi sao. Chỉ đơn giản chị ấy giới thiệu về tên mình và cổ vũ những người khuyết tật và kêu gọi sự trợ giúp và tài trợ giàn phơi thông minh. bao lăm ấy thôi cũng đủ làm cho chúng ta ấm lòng giữa đêm đông”.